Studio One Professional, General Sequencer from PreSonus in the Studio One 1 series. PreSonus invites Apple Mac users who wish to upgrade to Mac OS X 10.7, better known as Lion, to participate in a public beta-test of its Universal Control 1.5.2 software. Universal Control 1.5.2 makes all StudioLive-series digital mixers and all FireStudio-series interfaces except the original FireStudio (26x26) OS X Lion-compatible. The public beta of Universal Control 1.5.2 is available now at the Technical Support/Downloads section of the PreSonus Web site. PreSonus also has released Studio One Artist 1.6.5 and Studio One Pro 1.6.5. The new versions add Mac OS X 10.7 (Lion) compatibility. In addition, with version 1.6.5, Studio One has been translated into French and Spanish. Studio One users can upgrade their copies through their PreSonus user accounts. This is a free upgrade. HyperSynth Miniak-editor for Mac Hypersynth has released the Mac OS X AU version of Miniak-editor. 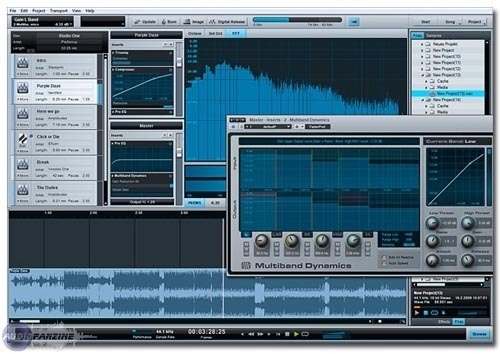 Nugen Loudness Management Batch Processor Nugen Audio has released LMB, a standard compliant, windows based, file loudness measurement and correction solution.